New York feels unsettled these days, an agitation reflected even at the venerable Film Festival, whose offerings are generally in keeping with its discriminating venue – the Lincoln Center for the Performing Arts. Festival is a bit of a misnomer, the program closer to a stately pageant; with nearly every film slated for release, the NYFF serves largely as a swank preview and a chance to see and hear a few actors and directors. Taken all together, the NYFF selections offered no reassurance and little escapism – just right for the current state of uncertainty. Discoveries were few, but neither were the choices obvious: in scope and variety, this year’s jury showed real verve. 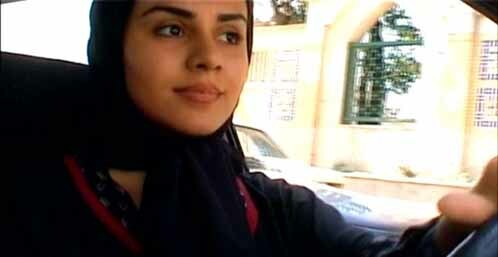 Abbas Kiarostami’s Ten put a moving car to inspired use, with an attractive woman (Mania Akbari) carrying on ten conversations with other women and her unpleasant and demanding young son as she drives them around Tehran. The film is not only a devastating look at the situation of Iranian women but also study of a modern enclosure private and not-so: the interior of a car. Palestinian Elia Suleiman makes further use of this ordinary-yet-peculiar space in his highly intelligent and wry Divine Intervention. Vignettes show Palestinian life as a combination of circumstances both dire and petty, often at the same time. A couple’s trysts take place at an Israeli checkpoint outside Ramallah; they watch the proceedings from his car with the same detachment as at a drive-in. Apt and keen-witted, Divine Intervention is geographically specific and philosophically global: no nation is immune from these terrible absurdities. Historical politics figured in Bloody Sunday, Paul Greengrass’s bracing recapitulation of the protest-march-turned-massacre of January 30, 1972 in Derry, Northern Ireland. Spare and even-handed, the film manages above all to convey the immense bewilderment, the awful chaos of the event. Particularly effective is the use of sound: not only is there no music, but sounds fade in and out of earshot, becoming clear and opaque in the same way that one’s vision does in such confusion. Like Divine Intervention, Bloody Sunday‘s focus is particular, its implications universal. Two films shared World War II as a historical backdrop. Traudl Junge, the eponymous speaker in André Heller’s documentary Blind Spot: Hitler’s Secretary, gave what amounted to a death-bed confession (she died just days after the film’s release early in 2002) about her stint in the Führer’s inner sanctum, a matter she kept quiet for 50 years. Heller spoke to Junge for more than ten hours, including filming her subsequent reactions as she watched herself on video; a composed and dignified older woman, Junge’s gradual admission of her dogged denial regarding her “pleasant” boss makes for a disturbing character study. Similar concerns fuel Safe Conduct, Bertrand Tavernier’s fictionalized version of real events in 1942 German-controlled French moviemaking. Tavernier follows Jean Devaivre (Jacques Gamblin) and Jean Aurenche (Denis Podalydes), an assistant director and a scriptwriter/poet respectively, in an enormously likable and complicated film that feels at times a bit like Mike Leigh’s Topsy-Turvy: many small but memorable characters and situations in which reality and fiction overlap and sometimes mesh. Like Blind Spot, Safe Conduct conveys the incognizance that marked a time when no one knew what would happen next. Tavernier taps into something of Michael Powell’s spirit, particularly in Devaivre, whose active relationship to his moral compass recalls Powell’s wartime characters. Morality plays its part in Aki Kaurismäki’s winning Man Without a Past, which demands of its characters many difficult choices. Robbed and left for dead, A Man (Markku Peltola) revives in a hospital, his problems compounded by amnesia. He finds a new life in a shanty town on the outskirts of Helsinki, its camaraderie reminiscent of Vittorio De Sica’s Miracle in Milan. Deft and mordant, Man Without a Past takes on big questions – identity, success, midlife love and the pervasive influence of American music by way of jukeboxes. Kaurismäki’s touch is as light as his colors are bold, the film both thoughtful and amusing. One of the most beautiful entries was Tian Zhuangzhuang’s Springtime in a Small Town, a melancholy tale, set in 1946, of an ailing young landowner Dai Li-yan (Wu Jun), his teenaged sister (Lu Sisi), and his stunning, disenchanted wife Yu Wen (Hu Jingfan). A visit from his best friend Zhang Zhi-chen (Xin Bajqing), who was also his wife’s old lover, sets the household spinning. Zhuangzhuang shows a country house of Chekhovian suppression, where decorum keeps the tension in a virtual stranglehold. Passion was given free rein in Friday Night (Claire Denis), a clear wish-fulfillment of anyone who’s ever sat in traffic. Unbeknownst to Laure (Valérie Lemercier), her attempt to cross Paris on the night before she is to move in with her lover will be thwarted by a general strike of all public transportation (Denis includes a lovely shot of the silent metro tunnels). The city has come to a complete halt. Encouraged by her radio to offer lifts to victims of the strike, she welcomes Jean (Vincent Lindon) into her car. Their delirious one-night stand (they eventually leave the car) seems fantastic and utterly credible; Denis marshals the women’s-magazine-worthy story into a compelling examination of risk and commitment, managing to tell an intimate story while preserving a certain mystery. In Talk to Her (the closing night selection), Pedro Almodovar keeps his melodramatic inclinations under control with his customary cockeyed plot twists. Coincidentally, Benigno (Javier Camara) and Marco (Dario Grandinetti) meet at a clinic where the women they love are both in comas. Their friendship is the engine of the film, with lovely asides to a silent film-within-the-film and special performances by Pina Bausch and Caetano Veloso. Like Fellini or Bergman, Almodovar puts his particular stamp on his films and either one responds or not: there’s no middle ground. In Talk to Her, he shows the power movies have as personal narrative; that they become part of our personal history (Victor Erice used Frankenstein similarly in The Spirit of the Beehive), a risky experiment that pays off beautifully. The effect of media is clear in Waiting for Happiness, Abderrahmane Sissako’s look at the ways West Africans have made the modern world their own. At the center is Abdallah (Mohamed Mahmoud Ould Mohamed), a 17-year-old in the process of leaving for Europe. Aside from the blatant technological touches, there are the more low-key transformations of ordinary objects into parallels to the industrialized world: the street-level window at which Abdallah and his mother sit is a kind of television, the daily activities of their tiny village boxed by its frame. Electric wiring is a luxury, available only sporadically, yet the technology has already influenced the way these villagers circumscribe their world. At the other end of the spectrum but also addressing consumer society is My Mother’s Smile by Marco Bellocchio. A profoundly Italian story of an estranged and non-believing 40-ish man (Sergio Castellitto) who is summoned to the Vatican to assist in the campaign to canonize his mother, My Mother’s Smile manages to show the Catholic church as the ultimate in corporate control and branding. Using two of Rome’s key power symbols – the dome of St. Peter’s and the Vittorio Emanuele Monument – Bellocchio makes sly visual commentaries on the complicated religious and secular forces that shaped and continue to shape Italy. With one exception, American films made an especially strong showing. The contrived, puerile, and deeply unfunny Punch-Drunk Love by Paul Thomas Anderson had centerpiece status, a misstep that, given the overall high caliber of the festival jury’s choices, seemed guided less by judgment than trendiness. In contrast, Pat O’Neill’s The Decay of Fiction, which, like Anderson’s film, is set in Los Angeles, showed real daring. Using the Ambassador Hotel as the backdrop for magnificent effects, O’Neill actually makes the peeling paint of the abandoned suites appear to be remembering better days, his shadows more corporeal than the transparent residents and echoed voices with which he animates the abandoned hostel. A searing documentary by Jennifer Dworkin, Love and Diane, details three generations of a Brooklyn family struggling to work in the social welfare system. Separated from her crack-addicted mother for more than five years, Love and her siblings are reunited with their mother – and Love’s newborn, Donyeah. Their story is remarkable for its ordinariness, for the tedium and constant struggle that defines their daily life. A lengthy and disturbing film that makes its important points by accretion of detail rather than hectoring. Alexander Payne’s About Schmidt opened the festival, its status surely due to Jack Nicholson’s starring role as Warren Schmidt, a milquetoast insurance salesman who retires and becomes a widower nearly simultaneously. He is determined to stop his daughter Jeannie (Hope Davis) from marrying her deeply disappointing waterbed salesman fiancé, Randall (Dermot Mulroney). Payne smartly resists condescending to his characters; their earnest attempts to come to terms with unstoppably confessional modern American life are played completely straight (Kathy Bates as Randall’s uninhibited mother is of particular note), the result reminiscent of Milos Forman’s Taking Off. Auto Focus, Paul Schrader’s nominal biography of Bob Crane (played by Greg Kinnear) uses the small-time celebrity to examine fundamental questions about America’s jumbo-sized capacity for cognitive dissonance (exemplified not least in the popularity of Hogan’s Heroes). Together with his cocktail-lounge friend John Carpenter (played to the full, slithering hilt by Willem Dafoe), Crane indulged every (rather pedestrian) sexual whim and, supplied by Carpenter, videotaped his escapades. Schrader makes no overt commentary, allowing these two to hoist themselves on their own naugahyde petard. Finally, the absolute stunner of the festival: Jean-Pierre and Luc Dardenne’s The Son. A deceptively simple story of a carpenter, Olivier (the consistently excellent Olivier Gourmet), who teaches at a training center for troubled teenage boys, and Francis (Morgan Marinne), a parolee who comes into his shop. The Dardennes train their camera on Gourmet, relentlessly cataloguing his physical details, closing in on his large head and dense glasses with almost claustrophobic zeal. The scrutiny forces the viewer to question what is going on inside Olivier, why he chooses to take the often self-destructive actions he does. Slowly, his story emerges, culminating in a connection to Francis that seems fated. The Son has no music or exposition and actually resists passive consumption; a startling film gutsy enough to take on the necessary and difficult question of what it means to forgive.